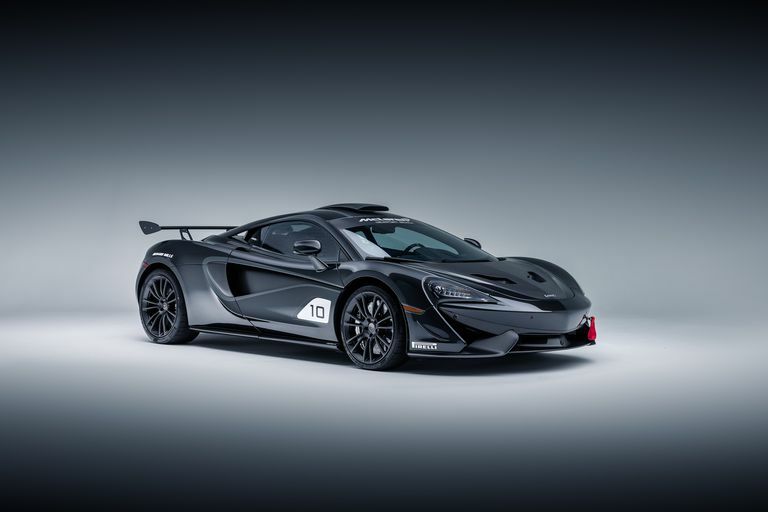 McLaren Special Operations, the customization division for McLaren’s road car department, has just revealed another new product. This time, it’s a special edition GT4-inspired 570S built specifically for customers of McLaren Newport Beach, the company’s largest US retailer. The McLaren “MSO X” was commissioned as a bespoke project to emulate the look and feel of the company’s 570S GT4 race car, but on a street-legal vehicle. Basically, it’s a 570S with a swath of track-ready upgrades, including a functional roof snorkel, front dive planes, a titanium exhaust, P Zero Corsa tires, carbon fiber bodywork, and, of course, that big rear wing, which produces 220 pounds of downforce. The interior is equally racy, with an exposed carbon fiber monocoque, carbon fiber seats, and a bespoke carbon fiber rear bulkhead where you can store a helmet. The center storage console has been deleted, while the rest of the console has been trimmed in carbon fiber. The car comes standard with a color-matched harness bar for easy six-point belt installation. All ten—yes, just ten—examples of the MSO X have already been sold and delivered to customers. Sorry McLaren race fans, you’ll have to buy a used once they start coming up for sale. They’ll surely be cheap. Tis the Season for a New Vehicle: Tax Time is a Great Time to Upgrade!